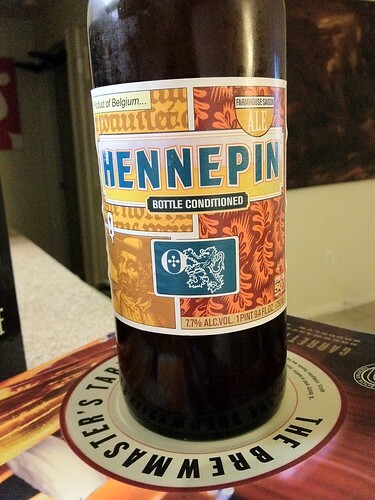 Ommegang Hennepin, originally uploaded by adambarhan. A – Pours out clear golden in color. Carbonation is champagne like and constant. The head is two fingers of white foam. Retention is good but lacing is a moderate. S – The nose is excellent. Lots of clove and black pepper spice. Belgium yeast, banana and faint wheat characters thought the middle. Sweet white grape as well. Hints of alcohol. Complex. T – Yeasty, spicy, grainy, fruity, it just like it smells. M – Smooth and refreshing with a champagne like finish. O – Pretty good. Lots of flavors going on and melded so well together. Excellent to say the least.